Armed Forces Day Luncheon in honor of our military service members, both in service and those retired. 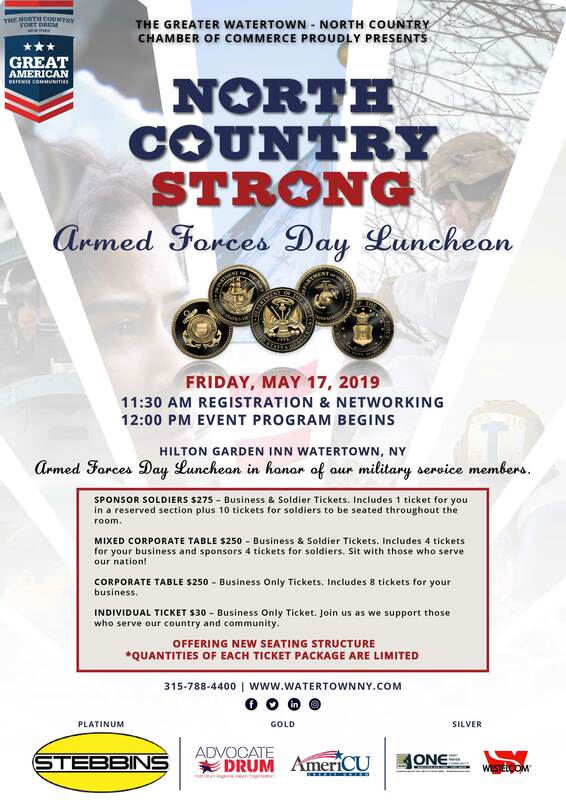 Join us as we connect our business community with service member stationed at Fort Drum. Sponsor Soldiers $275 – Business & Soldier Tickets. Includes 1 ticket for you in a reserved section plus 10 tickets for soldiers to be seated throughout the room. Mixed Corporate Table $250 – Business & Soldier Tickets. Includes 4 tickets for your business and sponsors 4 tickets for soldiers. Sit with those who serve our nation! Corporate Table $250 – Business Only Tickets. Includes 8 tickets for your business. Individual Ticket $30 – Business Only Ticket. Join us as we support those who serve our country and community. Enjoy grilled Bourbon Chicken thighs served with mashed potatoes, seasonal vegetables and followed by carrot cake.